…opponent, you should get something very similar to what you lose: a bishop for a bishop, a queen for a queen, or perhaps a knight for a bishop. Try that same idea with your investments. Let’s say you own a bond from the EFG Company, which matures in four years and has an “A” rating from Standard & Poor’s. On top of that, this bond currently shows a $5,000 loss. In the multi-trillion dollar bond market, you won’t have a hard time finding a similar bond, perhaps from the LMN Company, which also comes due in around four years and has a similar rating from the rating agencies. Sell the first bond and buy the second and you will get to use the loss against other gains and, at the same time, still have a very similar investment in your portfolio. Because different companies have issued the bonds, that is, you sold the EFG and bought LMN, the IRS will not consider the securities significantly similar and will allow you to use the $5,000 loss to offset other gains you may have. Tax-loss swaps don’t offer you this “best-of-both-worlds opportunity” only in stocks and bonds. If you own ETFs (exchange traded funds), you can unload a losing position and buy a similar fund at the same time and possibly make use of the tax-loss. Find out more by reading “Benefiting from losses in ETFs” at www.RichAsAKing.com/bonus. 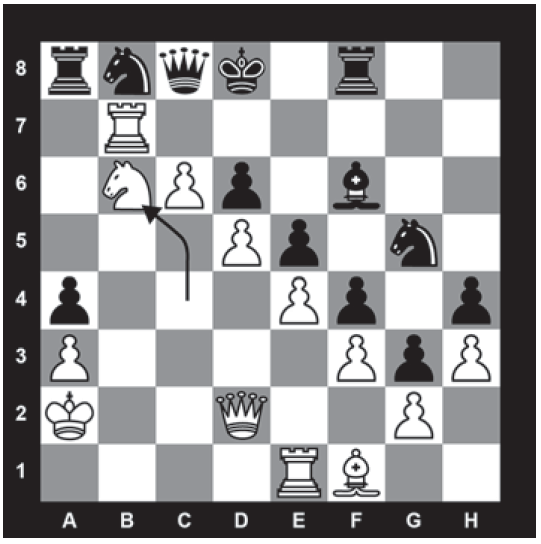 If a grandmaster chooses to swap pieces with her opponent, and she has a choice as to which piece she can use to make the capture, she’ll usually select a piece that could benefit from further development. Early on in a game, for example, she will try to make each move not only challenge the opposition, but also try to take over space in the center of the board. At the end of a game, too, she will look to accumulate extra benefits from each move. At the end of this 1980 game, take a look at how White sacrificed the bishop for a pawn (Bb6), not normally considered an equal trade. Now, at this point, the white knight simultaneously threatened both the rook and queen (which had no escape route), so Black resigned. 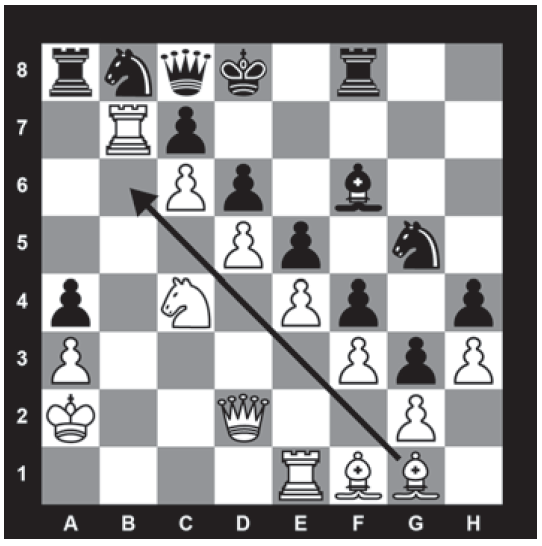 Thus, White not only swapped pieces, giving up a bishop in exchange for a pawn, but dramatically improved the position of the fighters to the point where Black no longer had any possibility of success. When you sell an investment, whether to gain the tax benefit or to strengthen your portfolio, plan to take the money and develop it, making it more productive by transferring it to a new and even better investment. All too often, investors feel the need to do something, anything at all, which leads them to make lateral exchanges. For example, they’ll sell one mutual fund and buy another, even though the newer one doesn’t offer any additional benefits compared with the older one. Exiting an existing annuity or insurance policy might entail surrender charges. Even if terminating one policy won’t cost you any fees, the new policy might lock you into a new surrender charge period. Being locked into the new policy might mean you won’t have immediate access to the money (even though you may have qualified under your old policy if the surrender period had ended). The new policy might have various hidden fees that cost more than those found in the original policy. Compare the fees for administration, M&E (mortality and expense), maintenance, surrender charges, and fund expenses. Will you have a greater investment selection in the new policy? Check that the new policy not only has a wide variety of fund choices, but also see to it that the funds represent all the basic asset classes (stocks, bonds, money markets, real estate, commodities, etc.). Does the new policy lock you into buying funds only from their company? Getting stuck in their proprietary investment choices could limit your returns. Just like chess players, investors must also consider when to let go of an asset. An underperforming position can often wreak havoc on your overall situation, so try to dispose of it as soon as possible.